Alton Lane, Atlanta’s newest high-end men’s store, is an interesting mix of seeming opposites: traditional Savile Row-style tailoring paired with high-tech suit fittings; appointment-based service with moderate prices; an uncluttered, custom-order-only showroom that suggests seriousness with a private room in the back for playing poker or watching football. 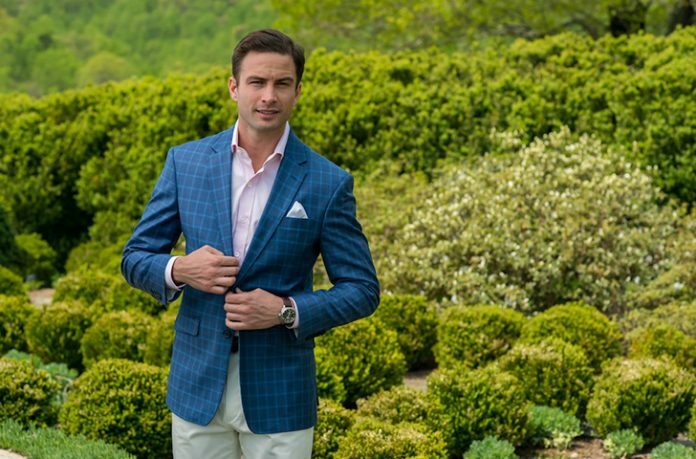 But the contrasts are all part of the original vision of co-founders Colin Hunter and Peyton Jenkins, friends since their days at the University of Virginia who, after stints in corporate finance, decided they could blend innovation with personalized service to offer men bespoke clothing in a relaxed environment. First opening in their home base of Manhattan in 2009 and spreading to Richmond, Boston, and three other major cities, the company plans to open five more stores this year after Atlanta. Every article of clothing sold by Alton Lane—suits, shirts, and trousers—is made to order. Items on display showcase fabrics and styling options, such as: bold lining or subtle? Spread collar or cutaway? To pick-stitch or not pick-stitch? Nearly all of the clothing on display could be worn at the office without incident; a pair of orange chinos and tuxedo jacket in a black-on-black jacquard camo weave are the flashiest items onsite. But many of the shirts have contrasting fabric inside the cuff and collar, and the founders insist that dandies are welcome. Although the doors of the new store in the West Buckhead Village will remain open to walk-ins and browsers, Alton Lane is set up to operate mostly by appointment. “We basically shut down the store for an hour for each customer,” explains Hunter. A first-time visit would likely involve the customer stepping into a curtained booth where the shop’s 3-D body scanner will use infrared technology to capture 300 measurements in 30 seconds, including such important details as posture and whether one shoulder sits lower than the other. The measurements are so precise, says Hunter, that regular customers can order clothes simply by text message without stopping by for a fitting. Decisions about fabrics and features are typically made over sips of bourbon at the custom-made wooden bar, where a customer can discuss his styling preferences while keeping tabs on the game on a nearby TV. When an order is placed, the company sends it along to one of five factories it uses in Europe or Asia, with the finished garment available in four to five weeks, a speedier turnaround than many custom shops. Despite the gentrified space, the personalized service, and high-end materials—Thomas Mason shirting cloth, Scabal suiting fabric, mother-of-pearl and horn buttons—Alton Lane’s founders aim to make clear that their stores are not the exclusive domain of one-percenters. Shirts start at $99, running to $199 for Italian linen. Chinos in an array of colors can be had for $155. The entry-level suit is $595, up into the thousands if you’ve just got to have it in, say, a rare Peruvian vicuña. Hunter says the savings are realized through efficiencies, such as having no onsite inventories of fabrics or clothing stock. Which does mean that Alton Lane is not a one-stop shop—it doesn’t sell socks, swim trunks, shoes, or even golf shirts—although Jenkins says customer demand has prompted them to offer American-made denim in the near future. But don’t plan to walk out with a new pair of jeans on your first visit—even those will be made to order. 24 E. Andrews Drive. (888)-800-8616. www.altonlane.com. Appointments are available Tuesday through Sunday 9 a.m.-8 p.m.